I am a pen addict. I love pens of all kinds. Ball point, ink roller, glitter, fountain, colored, black, blue, fancy, cheap, and even markers, too. Each year (okay, a few times each year), I buy a new set of multi-colored pens or Sharpie markers to color-code my calendars, lists, and my life. My husband teases me, but accepts that he has an easy out anytime he needs a small gift to give me. I was beyond excited when I recently found a multi-colored five pack of Sharpie markers at the local dollar store. Sharpies are usually much pricier (because they are the best), so I snatched up two of the five-packs before they disappeared. I’ve been using these new markers for a few weeks now, but I was really disappointed that they just didn’t work as well. I went back and forth with my reasoning. “Well, I guess you get what you pay for,” I told myself. “These write like dollar store markers.” But then I’d argue back to myself, “But they’re SHARPIES. The company didn’t know they’d be sold at the dollar store. So they should work just as well, right?” Unfortunately, no one won the argument since both voices in my head are too stubborn to give in. It wasn’t until this week, as I was attempting to label my kids’ lunch boxes, water bottles, backpacks, and smocks that I got really aggravated. The marker wrote so light on things that I’d try to go over it again. But writing over the same lettering only removed the ink that was barely there to begin with. “Come ON! !” I shouted at the stupid marker in my hand. I was so frustrated that I decided to write to the company to see if they would reimburse me for their faulty product. Dollar store or not, I figured, the company should stand behind its name. So I looked closely at the marker in my hand and tried to find a location to google. That’s when I realized what I had in my hand was not, in fact, a real Sharpie. It was, instead, a Shoupie. I’m not kidding. This knock-off looked exactly like the Sharpies. The packaging was the same, the design was the same, the size, style, and script of the name was the same. Two little letters written to deceive did their job. I had been Shouped. Don’t let this happen to you. Let my misfortune be a lesson to all Sharpie lovers out there. The Shoupies are out there, waiting to lure you into their trap of thrift. Do not be deceived. 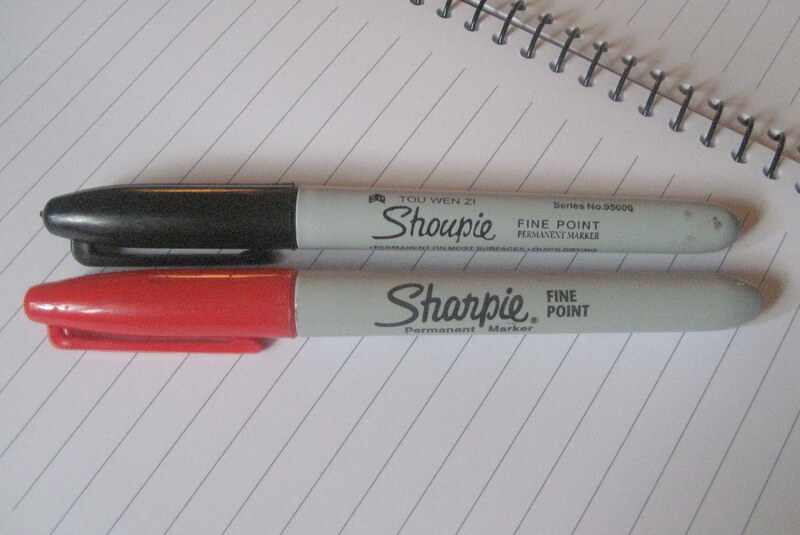 There is only one Sharpie. Don’t get Shouped. Oh my God, this made me laugh out loud Stace! The fact that it is really called that is totally hilarious!!! I keep all colors of Sharpies at home. And I love pens!